Robust earnings and a growth in its eFX segment has Swissquote's stock soaring to 2017 highs. Swissquote Group Holding SA (SWX:SQN) reported its latest earnings for Q2 ending June 30, 2017. In doing so the Swiss financial services provider saw an explosion of its net revenues and overall earnings, driving its share prices to the highest level since September 2014. Looking specifically at Swissquote’s Q2 earnings, the group saw its net revenues increase by 19.0 percent higher year-over-year to CHF 89.1 million ($92.4 million) in the six months ending on June 2017. This was also higher on a quarterly basis, justifying a jump of 18.0 percent when compared to the first half of last year. Swissquote also saw an outperformance in its operating revenues, which rose by a robust margin of 17.7 percent to CHF 90.5 million ($92.8 million). This was mainly attributed to a methodic rise in fees, commissions and electronic FX trading. With regards to its eFX segment, revenues hit a new all time high of over CHF 32.6 million ($33.8 million), which is higher by 16.5 percent when compared to the same period a year ago. The group’s share prices (SWX:SQN) have been maintaining a slightly upward tone in 2017, with the last major move taking place in March of this year. Year-to-date, Swissquote shares had already been noticeably higher even before its recent earnings release, rising by 18.4 percent since January 1, 2017. However, yesterday’s earnings provided a needed impetus that catapulted Swissquote’s shares out of a narrow consolidation seen in place since May 2017. On the heels of the positive earnings, shares surged over 13.0 percent at the time of the earnings release, with its strong metrics helping bolster the group’s case to shareholders. Swissquote has already had an eventful Q2, highlighted by a series of company developments that have corresponded to its financial outperformance. As mentioned above, the group’s eFX segment was very strong in Q2, with accounts growing 32.0 percent year-over-year. Meanwhile, Swissquote also continued capitalizing on its robo-advisory ePB accounts, swelling to 1,652 in the quarter, or 15.0 percent higher year-over-year. Last month, the Swiss bank also became the first online bank to launch Bitcoin trading. The company has since pioneered a new product for the brokerage industry, opting to launch trading in the virtual currency without leverage – a noteworthy development. Clients of the Swiss brokerage will be able to exchange euros and USD into Bitcoin using their trading accounts. Earlier in the quarter, the group also unveiled a series of social media upgrades that dealt with pertinent trading events, namely the French elections. 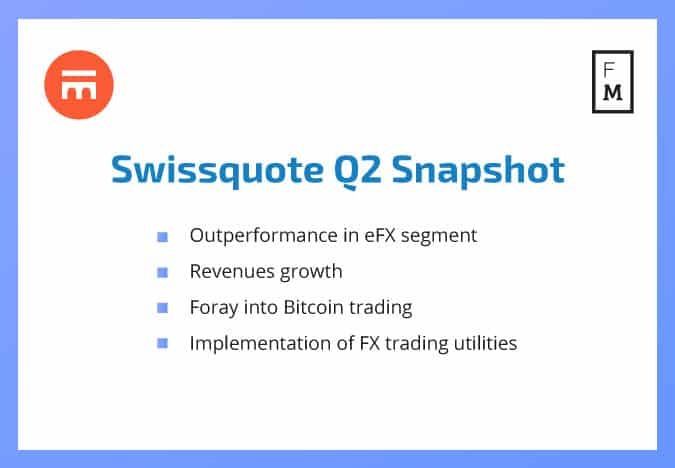 During Q2 Swissquote deployed multiple utilities to help fortify the tools at FX traders’ disposal. Moreover, Swissquote extended its product cope on its over-the-counter (OTC) trading platform, Swiss DOTS, enlisting Vontobel Investment Banking as its fifth issuer.